Publication details: Book. 2008. xiv and 150 pages. Publication date: 2008-10-21. 11 tables and 57 figures, of wich1 in full colour. Hardbound. 16x24 cm (6.3x9.4 in). This is the fifth glaucoma World Glaucoma Association Consensus. 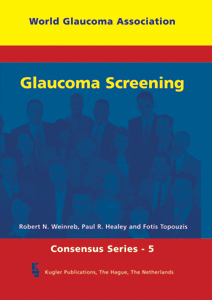 As with other consensus topics, the discussion and conclusions of Glaucoma Screening, the subject for the 2008 consensus, will have broad impact. The global faculty, consisting of leading authorities on various aspects of glaucoma screening, met in Fort Lauderdale on April 26, 2008 to discuss the reports and refine the consensus statements. The Consensus Panel also met at that time, as well as electronically during the subsequent four weeks. Obtaining consensus on how best to conduct glaucoma screening is quite a challenge, especially since the epidemiology and testing paradigms are so different for open-angle and angle-closure glaucoma. As with the previous WGA consensuses, the Glaucoma Screening consensus was based on the published literature and expert experience. Although consensus does not replace and is not a surrogate for scientific investigation, it does provide considerable value, especially when the desired evidence is lacking. The goal of this consensus was to establish the best practice for glaucoma screening, as well as to identify those areas for which we have little evidence and, therefore, need additional research. We hope that this consensus will serve as a benchmark of our understanding, and that it will be revised and improved with the emergence of new evidence. For the World Glaucoma Association Consensus V, our topic was Glaucoma Screening, both for open-angle glaucoma and angle-closure glaucoma. Global experts were assembled beginning in January 2008 to participate in the Project Forum E-Room, a unique aspect to facilitate discussion of each of the consensus meetings. With each of the prior meetings, arriving at the consensus was circuitous and filled with compromises, and this meeting had a similar path. The consensus process provided an excellent opportunity to critically assess the evidence relating to glaucoma screening and develop consensus statements. As with previous ones, the entire process was stimulating, educational, and thought-provoking for all participants and attendees. Is OAG an important health problem? Is there an accepted and effective treatment for patients with the disease that is more effective at preventing morbidity when initiated in the early, asymptomatic stage than when begun in the later, symptomatic stages? Are facilities for diagnosis and treatment available? Is there an appropriate, acceptable, and reasonably accurate screening test? Is the natural history of the condition, including development from latent to manifest disease, adequately understood? Is the cost of case finding (including diagnosis and treatment of patients diagnosed) economically balanced in relation to possible expenditure on medical care as a whole? Are angle closure (AC) and angle-closure glaucoma (ACG) important health problems? Is there an accepted and effective treatment for patients with angle-closure glaucoma (ACG) that is more effective at preventing morbidity when initiated in the early, asymptomatic stage than when begun in the later, symptomatic stages?